Three basic categories of cells make up the mammalian body: germ cells, somatic cells, and stem cells. Each of the approximately 100 trillion (1014) cells in an adult human has its own copy or copies of the genome except certain cell types, such as red blood cells, that lack nuclei in their fully differentiated state. Most cells are diploid; they have two copies of each chromosome. Such cells, called somatic cells, make up most of the human body, such as skin and muscle cells. Cells differentiate to specialize for different functions. Germ line cells are any line of cells that give rise to gametes—eggs and sperm—and thus are continuous through the generations. Stem cells, on the other hand, have the ability to divide for indefinite periods and to give rise to specialized cells. They are best described in the context of normal human development. Radial glial cells (embryonic neural stem cells) that give rise to excitatory neurons in the fetal brain through the process of neurogenesis. Muscle satellite cells (progenitor cells) that contribute to differentiated muscle tissue. A pathway that is guided by the cell adhesion molecules consisting of four amino acids, arginine, glycine, asparagine, and serine, is created as the cellular blastomere differentiates from the single-layered blastula to the three primary layers of germ cells in mammals, namely the ectoderm, mesoderm and endoderm (listed from most distal (exterior) to proximal (interior)). The ectoderm ends up forming the skin and the nervous system, the mesoderm forms the bones and muscular tissue, and the endoderm forms the internal organ tissues. Micrograph of a liposarcoma with some dedifferentiation, that is not identifiable as a liposarcoma, (left edge of image) and a differentiated component (with lipoblasts and increased vascularity (right of image)). Fully differentiated (morphologically benign) adipose tissue (center of the image) has few blood vessels. H&E stain. Dedifferentiation, or integration is a cellular process often seen in more basal life forms such as worms and amphibians in which a partially or terminally differentiated cell reverts to an earlier developmental stage, usually as part of a regenerative process. Dedifferentiation also occurs in plants. Cells in cell culture can lose properties they originally had, such as protein expression, or change shape. This process is also termed dedifferentiation. Some believe dedifferentiation is an aberration of the normal development cycle that results in cancer, whereas others believe it to be a natural part of the immune response lost by humans at some point as a result of evolution. A small molecule dubbed reversine, a purine analog, has been discovered that has proven to induce dedifferentiation in myotubes. These dedifferentiated cells could then redifferentiate into osteoblasts and adipocytes. An overview of major signal transduction pathways. A few evolutionarily conserved types of molecular processes are often involved in the cellular mechanisms that control these switches. The major types of molecular processes that control cellular differentiation involve cell signaling. Many of the signal molecules that convey information from cell to cell during the control of cellular differentiation are called growth factors. Although the details of specific signal transduction pathways vary, these pathways often share the following general steps. A ligand produced by one cell binds to a receptor in the extracellular region of another cell, inducing a conformational change in the receptor. The shape of the cytoplasmic domain of the receptor changes, and the receptor acquires enzymatic activity. The receptor then catalyzes reactions that phosphorylate other proteins, activating them. A cascade of phosphorylation reactions eventually activates a dormant transcription factor or cytoskeletal protein, thus contributing to the differentiation process in the target cell. Cells and tissues can vary in competence, their ability to respond to external signals. 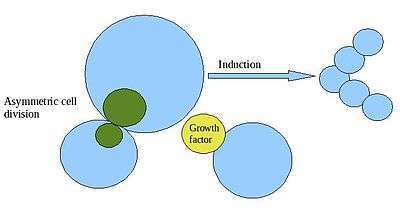 Signal induction refers to cascades of signaling events, during which a cell or tissue signals to another cell or tissue to influence its developmental fate. Yamamoto and Jeffery investigated the role of the lens in eye formation in cave- and surface-dwelling fish, a striking example of induction. Through reciprocal transplants, Yamamoto and Jeffery found that the lens vesicle of surface fish can induce other parts of the eye to develop in cave- and surface-dwelling fish, while the lens vesicle of the cave-dwelling fish cannot. Other important mechanisms fall under the category of asymmetric cell divisions, divisions that give rise to daughter cells with distinct developmental fates. Asymmetric cell divisions can occur because of asymmetrically expressed maternal cytoplasmic determinants or because of signaling. In the former mechanism, distinct daughter cells are created during cytokinesis because of an uneven distribution of regulatory molecules in the parent cell; the distinct cytoplasm that each daughter cell inherits results in a distinct pattern of differentiation for each daughter cell. A well-studied example of pattern formation by asymmetric divisions is body axis patterning in Drosophila. RNA molecules are an important type of intracellular differentiation control signal. The molecular and genetic basis of asymmetric cell divisions has also been studied in green algae of the genus Volvox, a model system for studying how unicellular organisms can evolve into multicellular organisms. In Volvox carteri, the 16 cells in the anterior hemisphere of a 32-cell embryo divide asymmetrically, each producing one large and one small daughter cell. The size of the cell at the end of all cell divisions determines whether it becomes a specialized germ or somatic cell. Since each cell, regardless of cell type, possesses the same genome, determination of cell type must occur at the level of gene expression. While the regulation of gene expression can occur through cis- and trans-regulatory elements including a gene’s promoter and enhancers, the problem arises as to how this expression pattern is maintained over numerous generations of cell division. As it turns out, epigenetic processes play a crucial role in regulating the decision to adopt a stem, progenitor, or mature cell fate. This section will focus primarily on mammalian stem cells. In systems biology and mathematical modeling of gene regulatory networks, cell-fate determination is predicted to exhibit certain dynamics, such as attractor-convergence (the attractor can be an equilibrium point, limit cycle or strange attractor) or oscillatory. The first question that can be asked is the extent and complexity of the role of epigenetic processes in the determination of cell fate. A clear answer to this question can be seen in the 2011 paper by Lister R, et al. on aberrant epigenomic programming in human induced pluripotent stem cells. As induced pluripotent stem cells (iPSCs) are thought to mimic embryonic stem cells in their pluripotent properties, few epigenetic differences should exist between them. To test this prediction, the authors conducted whole-genome profiling of DNA methylation patterns in several human embryonic stem cell (ESC), iPSC, and progenitor cell lines. Female adipose cells, lung fibroblasts, and foreskin fibroblasts were reprogrammed into induced pluripotent state with the OCT4, SOX2, KLF4, and MYC genes. Patterns of DNA methylation in ESCs, iPSCs, somatic cells were compared. Lister R, et al. observed significant resemblance in methylation levels between embryonic and induced pluripotent cells. Around 80% of CG dinucleotides in ESCs and iPSCs were methylated, the same was true of only 60% of CG dinucleotides in somatic cells. In addition, somatic cells possessed minimal levels of cytosine methylation in non-CG dinucleotides, while induced pluripotent cells possessed similar levels of methylation as embryonic stem cells, between 0.5 and 1.5%. Thus, consistent with their respective transcriptional activities, DNA methylation patterns, at least on the genomic level, are similar between ESCs and iPSCs. However, upon examining methylation patterns more closely, the authors discovered 1175 regions of differential CG dinucleotide methylation between at least one ES or iPS cell line. By comparing these regions of differential methylation with regions of cytosine methylation in the original somatic cells, 44-49% of differentially methylated regions reflected methylation patterns of the respective progenitor somatic cells, while 51-56% of these regions were dissimilar to both the progenitor and embryonic cell lines. In vitro-induced differentiation of iPSC lines saw transmission of 88% and 46% of hyper and hypo-methylated differentially methylated regions, respectively. Two conclusions are readily apparent from this study. First, epigenetic processes are heavily involved in cell fate determination, as seen from the similar levels of cytosine methylation between induced pluripotent and embryonic stem cells, consistent with their respective patterns of transcription. Second, the mechanisms of de-differentiation (and by extension, differentiation) are very complex and cannot be easily duplicated, as seen by the significant number of differentially methylated regions between ES and iPS cell lines. Now that these two points have been established, we can examine some of the epigenetic mechanisms that are thought to regulate cellular differentiation. Three transcription factors, OCT4, SOX2, and NANOG – the first two of which are used in iPSC reprogramming – are highly expressed in undifferentiated embryonic stem cells and are necessary for the maintenance of their pluripotency. It is thought that they achieve this through alterations in chromatin structure, such as histone modification and DNA methylation, to restrict or permit the transcription of target genes. In the realm of gene silencing, Polycomb repressive complex 2, one of two classes of the Polycomb group (PcG) family of proteins, catalyzes the di- and tri-methylation of histone H3 lysine 27 (H3K27me2/me3). By binding to the H3K27me2/3-tagged nucleosome, PRC1 (also a complex of PcG family proteins) catalyzes the mono-ubiquitinylation of histone H2A at lysine 119 (H2AK119Ub1), blocking RNA polymerase II activity and resulting in transcriptional suppression. PcG knockout ES cells do not differentiate efficiently into the three germ layers, and deletion of the PRC1 and PRC2 genes leads to increased expression of lineage-affiliated genes and unscheduled differentiation. Presumably, PcG complexes are responsible for transcriptionally repressing differentiation and development-promoting genes. Alternately, upon receiving differentiation signals, PcG proteins are recruited to promoters of pluripotency transcription factors. PcG-deficient ES cells can begin differentiation but cannot maintain the differentiated phenotype. Simultaneously, differentiation and development-promoting genes are activated by Trithorax group (TrxG) chromatin regulators and lose their repression. TrxG proteins are recruited at regions of high transcriptional activity, where they catalyze the trimethylation of histone H3 lysine 4 (H3K4me3) and promote gene activation through histone acetylation. PcG and TrxG complexes engage in direct competition and are thought to be functionally antagonistic, creating at differentiation and development-promoting loci what is termed a “bivalent domain” and rendering these genes sensitive to rapid induction or repression. Regulation of gene expression is further achieved through DNA methylation, in which the DNA methyltransferase-mediated methylation of cytosine residues in CpG dinucleotides maintains heritable repression by controlling DNA accessibility. The majority of CpG sites in embryonic stem cells are unmethylated and appear to be associated with H3K4me3-carrying nucleosomes. Upon differentiation, a small number of genes, including OCT4 and NANOG, are methylated and their promoters repressed to prevent their further expression. Consistently, DNA methylation-deficient embryonic stem cells rapidly enter apoptosis upon in vitro differentiation. While the DNA sequence of most cells of an organism is the same, the binding patterns of transcription factors and the corresponding gene expression patterns are different. To a large extent, differences in transcription factor binding are determined by the chromatin accessibility of their binding sites through histone modification and/or pioneer factors. In particular, it is important to know whether a nucleosome is covering a given genomic binding site or not. Recent studies have elucidated the role of nucleosome positioning during stem cell development. A final question to ask concerns the role of cell signaling in influencing the epigenetic processes governing differentiation. Such a role should exist, as it would be reasonable to think that extrinsic signaling can lead to epigenetic remodeling, just as it can lead to changes in gene expression through the activation or repression of different transcription factors. Interestingly, little direct data is available concerning the specific signals that influence the epigenome, and the majority of current knowledge consist of speculations on plausible candidate regulators of epigenetic remodeling. We will first discuss several major candidates thought to be involved in the induction and maintenance of both embryonic stem cells and their differentiated progeny, and then turn to one example of specific signaling pathways in which more direct evidence exists for its role in epigenetic change. The first major candidate is Wnt signaling pathway. The Wnt pathway is involved in all stages of differentiation, and the ligand Wnt3a can substitute for the overexpression of c-Myc in the generation of induced pluripotent stem cells. On the other hand, disruption of ß-catenin, a component of the Wnt signaling pathway, leads to decreased proliferation of neural progenitors. Growth factors comprise the second major set of candidates of epigenetic regulators of cellular differentiation. These morphogens are crucial for development, and include bone morphogenetic proteins, transforming growth factors (TGFs), and fibroblast growth factors (FGFs). TGFs and FGFs have been shown to sustain expression of OCT4, SOX2, and NANOG by downstream signaling to Smad proteins. Depletion of growth factors promotes the differentiation of ESCs, while genes with bivalent chromatin can become either more restrictive or permissive in their transcription. Several other signaling pathways are also considered to be primary candidates. Cytokine leukemia inhibitory factors are associated with the maintenance of mouse ESCs in an undifferentiated state. This is achieved through its activation of the Jak-STAT3 pathway, which has been shown to be necessary and sufficient towards maintaining mouse ESC pluripotency. Retinoic acid can induce differentiation of human and mouse ESCs, and Notch signaling is involved in the proliferation and self-renewal of stem cells. Finally, Sonic hedgehog, in addition to its role as a morphogen, promotes embryonic stem cell differentiation and the self-renewal of somatic stem cells. The problem, of course, is that the candidacy of these signaling pathways was inferred primarily on the basis of their role in development and cellular differentiation. While epigenetic regulation is necessary for driving cellular differentiation, they are certainly not sufficient for this process. Direct modulation of gene expression through modification of transcription factors plays a key role that must be distinguished from heritable epigenetic changes that can persist even in the absence of the original environmental signals. Only a few examples of signaling pathways leading to epigenetic changes that alter cell fate currently exist, and we will focus on one of them. Expression of Shh (Sonic hedgehog) upregulates the production of BMI1, a component of the PcG complex that recognizes H3K27me3. This occurs in a Gli-dependent manner, as Gli1 and Gli2 are downstream effectors of the Hedgehog signaling pathway. In culture, Bmi1 mediates the Hedgehog pathway’s ability to promote human mammary stem cell self-renewal. In both humans and mice, researchers showed Bmi1 to be highly expressed in proliferating immature cerebellar granule cell precursors. When Bmi1 was knocked out in mice, impaired cerebellar development resulted, leading to significant reductions in postnatal brain mass along with abnormalities in motor control and behavior. A separate study showed a significant decrease in neural stem cell proliferation along with increased astrocyte proliferation in Bmi null mice. In summary, the role of signaling in the epigenetic control of cell fate in mammals is largely unknown, but distinct examples exist that indicate the likely existence of further such mechanisms. In order to fulfill the purpose of regenerating a variety of tissues, adult stems are known to migrate from their niches, adhere to new extracellular matrices (ECM) and differentiate. The ductility of these microenvironments are unique to different tissue types. The ECM surrounding brain, muscle and bone tissues range from soft to stiff. The transduction of the stem cells into these cells types is not directed solely by chemokine cues and cell to cell signaling. The elasticity of the microenvironment can also affect the differentiation of mesenchymal stem cells (MSCs which originate in bone marrow.) When MSCs are placed on substrates of the same stiffness as brain, muscle and bone ECM, the MSCs take on properties of those respective cell types. Matrix sensing requires the cell to pull against the matrix at focal adhesions, which triggers a cellular mechano-transducer to generate a signal to be informed what force is needed to deform the matrix. To determine the key players in matrix-elasticity-driven lineage specification in MSCs, different matrix microenvironments were mimicked. From these experiments, it was concluded that focal adhesions of the MSCs were the cellular mechano-transducer sensing the differences of the matrix elasticity. The non-muscle myosin IIa-c isoforms generates the forces in the cell that lead to signaling of early commitment markers. Nonmuslce myosin IIa generates the least force increasing to non-muscle myosin IIc. There are also factors in the cell that inhibit non-muscle myosin II, such as blebbistatin. 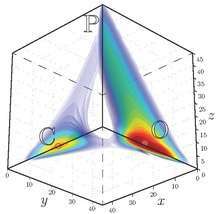 This makes the cell effectively blind to the surrounding matrix. Researchers have obtained some success in inducing stem cell-like properties in HEK 239 cells by providing a soft matrix without the use of diffusing factors. The stem-cell properties appear to be linked to tension in the cells' actin network. One identified mechanism for matrix-induced differentiation is tension-induced proteins, which remodel chromatin in response to mechanical stretch. The RhoA pathway is also implicated in this process. ↑ Kryven, I.; Röblitz, S.; Schütte, Ch. (2015). "Solution of the chemical master equation by radial basis functions approximation with interface tracking". BMC systems biology (9.1). ↑ Slack, J.M.W. (2013) Essential Developmental Biology. Wiley-Blackwell, Oxford. ↑ Slack, J.M.W. (2007). "Metaplasia and transdifferentiation: from pure biology to the clinic". Nature Reviews Molecular Cell Biology. 8: 369–378. doi:10.1038/nrm2146. ↑ "NCI Dictionary of Cancer Terms". National Cancer Institute. Retrieved 1 November 2013. ↑ Lodish, Harvey (2000). Molecular Cell Biology (4th ed.). New York: W. H. Freeman. Section 14.2. ISBN 0-7167-3136-3. ↑ Kumar, Rani (2008). Textbook of Human Embryology. I.K. International Publishing House. p. 22. ISBN 9788190675710. ↑ D. Binder, Marc; Hirokawa, Nobutaka; Windhorst, Uwe (2009). Encyclopedia of Neuroscience. Springer. ISBN 3540237356. ↑ Rash, BG; Ackman, JB; Rakic, P (February 2016). "Bidirectional radial Ca(2+) activity regulates neurogenesis and migration during early cortical column formation.". Science advances. 2 (2): e1501733. PMID 26933693. ↑ Stocum DL (2004). "Amphibian regeneration and stem cells". Curr. Top. Microbiol. Immunol. Current Topics in Microbiology and Immunology. 280: 1–70. doi:10.1007/978-3-642-18846-6_1. ISBN 978-3-540-02238-1. PMID 14594207. ↑ Casimir CM, Gates PB, Patient RK, Brockes JP (1988-12-01). "Evidence for dedifferentiation and metaplasia in amphibian limb regeneration from inheritance of DNA methylation". Development. 104 (4): 657–668. PMID 3268408. ↑ Giles KL. "Dedifferentiation and Regeneration in Bryophytes: A Selective Review". New Zealand Journal of Botany. 9: 689–94. doi:10.1080/0028825x.1971.10430231. ↑ Schnabel M, Marlovits S, Eckhoff G, et al. (January 2002). "Dedifferentiation-associated changes in morphology and gene expression in primary human articular chondrocytes in cell culture". Osteoarthr. Cartil. 10 (1): 62–70. doi:10.1053/joca.2001.0482. PMID 11795984. ↑ Sell S (December 1993). "Cellular origin of cancer: dedifferentiation or stem cell maturation arrest?". Environ. Health Perspect. 101 (Suppl 5): 15–26. doi:10.2307/3431838. JSTOR 3431838. PMC 1519468 . PMID 7516873. ↑ Tsonis PA (April 2004). "Stem cells from differentiated cells". Mol. Interv. 4 (2): 81–3. doi:10.1124/mi.4.2.4. PMID 15087480. ↑ Ben-Tabou de-Leon S, Davidson EH (2007). "Gene regulation: gene control network in development.". Annu Rev Biophys Biomol Struct. 36 (191): 191–212. doi:10.1146/annurev.biophys.35.040405.102002. PMID 17291181. 1 2 3 4 5 6 7 Rudel and Sommer; The evolution of developmental mechanisms. Developmental Biology 264, 15-37, 2003 Rudel, D.; Sommer, R. J. (2003). "The evolution of developmental mechanisms". Developmental Biology. 264 (1): 15–37. doi:10.1016/S0012-1606(03)00353-1. PMID 14623229. 1 2 Yamamoto Y and WR Jeffery; Central role for the lens in cave fish eye degeneration. Science 289 (5479), 631-633, 2000 Yamamoto, Y.; Jeffery, W. R. (2000). "Central Role for the Lens in Cave Fish Eye Degeneration". Science. 289 (5479): 631–633. Bibcode:2000Sci...289..631Y. doi:10.1126/science.289.5479.631. PMID 10915628. ↑ Kirk MM, A Ransick, SE Mcrae, DL Kirk; The relationship between cell size and cell fate in Volvox carteri. Journal of Cell Biology 123, 191-208, 1993 Kirk, M. M.; Ransick, A.; McRae, S. E.; Kirk, D. L. (1993). "The relationship between cell size and cell fate in Volvox carteri". Journal of Cell Biology. 123 (1): 191–208. doi:10.1083/jcb.123.1.191. PMC 2119814 . PMID 8408198. ↑ Rabajante JF, Babierra AL (January 30, 2015). "Branching and oscillations in the epigenetic landscape of cell-fate determination". Progress in Biophysics and Molecular Biology. doi:10.1016/j.pbiomolbio.2015.01.006. PMID 25641423. 1 2 Lister R; et al. (2011). "Hotspots of aberrant epigenomic reprogramming in human induced pluripotent stem cells". Nature. 471 (7336): 68–73. Bibcode:2011Natur.471...68L. doi:10.1038/nature09798. PMC 3100360 . PMID 21289626. 1 2 3 4 5 6 7 8 Christophersen NS, Helin K (2010). "Epigenetic control of embryonic stem cell fate". J Exp Med. 207 (11): 2287–95. doi:10.1084/jem.20101438. PMC 2964577 . PMID 20975044. ↑ Zhu, J.; et al. (2013). "Genome-wide chromatin state transitions associated with developmental and environmental cues". Cell. 152 (3): 642–654. doi:10.1016/j.cell.2012.12.033. PMID 23333102. 1 2 3 Guenther MG, Young RA (2010). "Repressive Transcription". Science. 329 (5988): 150–1. Bibcode:2010Sci...329..150G. doi:10.1126/science.1193995. PMC 3006433 . PMID 20616255. 1 2 3 Meissner A (2010). 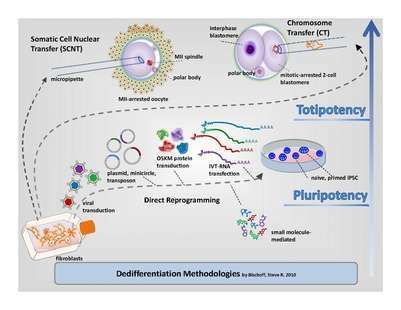 "Epigenetic modifications in pluripotent and differentiated cells". Nat Biotechnol. 28 (10): 1079–88. doi:10.1038/nbt.1684. PMID 20944600. 1 2 3 4 5 6 Mohammad HP, Baylin SB (2010). "Linking cell signaling and the epigenetic machinery". Nat Biotechnol. 28 (10): 1033–8. doi:10.1038/nbt1010-1033. PMID 20944593. ↑ Niwa H, Burdon T, Chambers I, Smith A (1998). "Self-renewal of pluripotent embryonic stem cells is mediated via activation of STAT3". Genes Dev. 12 (13): 2048–60. doi:10.1101/gad.12.13.2048. PMC 316954 . PMID 9649508. ↑ Liu S; et al. (2006). "Hedgehog Signaling and Bmi-1 Regulate Self-renewal of Normal and Malignant Human Mammary Stem Cells". Cancer Res. 66 (12): 6063–71. doi:10.1158/0008-5472.CAN-06-0054. PMID 16778178. ↑ Leung C; et al. (2004). "Bmi1 is essential for cerebellar development and is overexpressed in human medulloblastomas". Nature. 428 (6980): 337–41. Bibcode:2004Natur.428..337L. doi:10.1038/nature02385. PMID 15029199. ↑ Zencak D; et al. (2005). "Bmi1 loss produces an increase in astroglial cells and a decrease in neural stem cell population and proliferation". J Neurosci. 25 (24): 5774–83. doi:10.1523/JNEUROSCI.3452-04.2005. PMID 15958744. 1 2 Engler, AJ; Sen, S; Sweeney, HL; Discher, DE (August 2006). "Matrix Elasticity Directs Stem Cell Lineage Specification". Cell. 126: 677–689. doi:10.1016/j.cell.2006.06.044. PMID 16923388. Retrieved 2016-04-22. ↑ Guo, Jun; Wang, Yuexiu; Sachs, Frederick; Meng, Fanjie (2014-12-09). "Actin stress in cell reprogramming". Proceedings of the National Academy of Sciences. 111 (49): E5252–E5261. doi:10.1073/pnas.1411683111. ISSN 0027-8424. PMC 4267376 . PMID 25422450. ↑ Guilak, Farshid; Cohen, Daniel M.; Estes, Bradley T.; Gimble, Jeffrey M.; Liedtke, Wolfgang; Chen, Christopher S. (2009-07-02). "Control of Stem Cell Fate by Physical Interactions with the Extracellular Matrix". Cell Stem Cell. 5 (1): 17–26. doi:10.1016/j.stem.2009.06.016. PMC 2768283 . PMID 19570510.